Sometimes a picture is worth a thousand words. 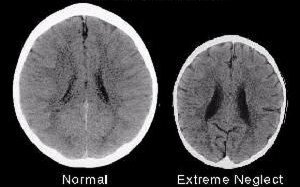 I frequently speak of early childhood trauma as having distinct physiological and neurological effects which can alter how the brain functions in later life. As science peers into the working of the brain through technologies like Functional Magnetic Resonance Imaging (fMRI) this notion consistently gains more scientific validity and credibility as time rolls on. It is not unreasonable to assume that most people tend to associate the big incidents, e.g., violence, sexual abuse, serious illness or injury etc. with trauma. But things like neglect or constant criticism and negative feedback are viewed as less detrimental to a person’s health and wellbeing. The reality is that, physical, psychological and emotional neglect have just as much as a detrimental impact as other types of abuses. The picture below is a side by side picture of two brains. One brain comes from a person who has not been neglected and the other comes from a person who was neglected as a child. The latter saw some extreme neglect as they were being raised. The child was ignored/neglected and abused. The results are striking. The child who has been abused and neglected is far more likely to commit a crime, have difficulty with empathy for others, and be likely to be less intelligent and far more likely to unemployed. The consequences of having a shriveled brain affect many areas of life, relationships, employment, legal, education etc. They often will struggle with emotions, feelings of being overwhelmed, and extremely negative mindsets and so on. Life is tough enough without having to face it with neurological deficits which then translate into life impediments. The whole key is for the child to receive plenty of positive attention, nurturance and love which is what happened with the child who has the larger brain. The scientific evidence suggests that the difference in cases like this is how the mother interacts with the child. I would suggest though that while the mother’s role is crucial so is the fathers whose role often gets overlooked in cases like this. In my professional experience it’s usually when both parents have been abusive or neglectful which gives the worst result for the child as they grow into adulthood and later are adults. Still we can only go on what we know thus far and I am sure most people will agree that the pictures are striking examples of what occurs when someone is abused and neglected. The one thing I think should be noted is that there is hope. The brain is remarkably adaptive and malleable. This high degree of neuroplasticity helps explain why many people are able to thrive after undergoing therapy. It seems like technologies like EMDR and techniques like hypnosis help shape our brain patterns. Meditation also has presented that it can shape and alter the brain. Being in a therapeutic and healing relationship, where one is listened to and attended to appropriately is often the catalyst which changes a persons life for the better. The point being that it is not necessarily a life sentence and that much can be done. But the work has to be done and therein lies the tragedy. If the child was bought up in a good and decent environment the work would not have to be done. As I keep saying life is not fair and as such we should not carry the expectation that life should be fair. We have to make do with what we have and often that is more than enough. Note: I should have mentioned the differences are attributable to abuse/neglect and not sickness or other causes. The study of these neurological deficits are quite clear on that point. Have You ever been Ghosted? Never required but always greatly appreciated. My name is Eddie, I work as psychotherapist where I hold advanced degrees in psychology. I have an interest in helping people achieve their aims and ambitions in life. I write on spirituality and psychology among other things at my web site located at http://edwardtraversa.com/ Drop me an email if you would like to discuss openings for therapy, or perhaps you just have a few questions on life, spirituality or psychology.